Summer is still in full force and Mulberrys continues to heat up! During the summer months, it is always common for us to see an influx of dry cleaning orders for garments that are made with the best fabrics for hot weather. Apart from cotton, the most popular seasonal fabric that we work with on a regular basis is linen. Linen is an incredibly interesting and versatile textile. Read on to learn 3 facts about linen that will help you better understand and care for your linen garments. 1) Linen is made from the flax plant, and it is incredibly laborious to manufacture. The process even has its own lingo! The flax plants must first be very gently harvested to retain the longest fibers possible (the longer the fibers, the softer the material they can be made into- shorter fibers result in a more course fabric). The plants then go through a drying and de-seeding process called “threshing” and “winnowing.” To loosen the fibers of the plant, the flax goes through a process called “retting” where the fibers are loosened with bacteria (or chemically), and then the loosened flax gets rolled by machine in a process called “scutching.” Finally, the fibers of the flax are combed in a step called “heckling,” where the corse short fibers are combed away with a heckling comb, leaving only the longest, softest fibers in place. 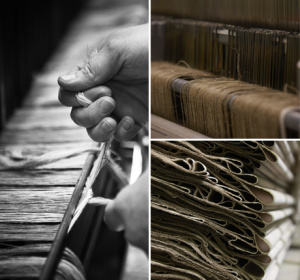 These are then spun into yarns or woven into the linen textiles that we’re familiar with! 2) Linen garments require extra TLC (in other words, if you want it to stay looking like new, don’t wash it at home)! Linen is durable and strong, but what happens when it gets wet? Linen is actually one of the few fabrics that gets stronger when it is wet. Pure linen fibers don’t stretch, and they are resistant to abrasion. However, because the fibers of linen fabric have such a low elasticity, they can break if they are folded and bent in the same area over and over. 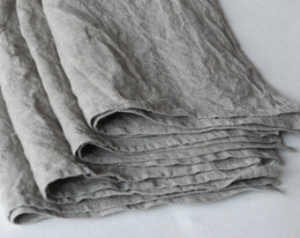 Constant creasing and pressing linen in the same area in a sharp fold can cause the fibers to deteriorate. This is why linen wrinkles so easily, and why the collars and hems of linen items can eventually begin to show wear and even break over time. However, the wrinkles of the linen are part of it’s charm, and give it a cozy lived-in vibe. To help retain the life of the linen garment, dry cleaning is a better method of cleaning. Dry cleaning protects the garment because it does not use water; because linen collects and looses water rapidly, the fibers break down and become soft. The more it is washed and dried in a traditional washing machine and dryer, the softer it will get, but the faster it will fall apart. If you want your linen garment to have a softer vibe, opt for laundering it, but if you want to retain the life of the garment, dry cleaning is the way to go. 3) Despite the upkeep, linen is fashionably effortless! Have you ever seen someone in linen that didn’t look cool? We didn’t think so :). Linen is a universal staple, and you can find it in leisurewear as well as formal attire all around the world. 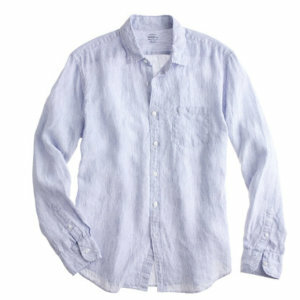 And since linen feels cool to the touch, and absorbs moisture, it will literally help you feel cool in the summer. To try the linen look for yourself, pick ONE linen item at a time (it’s easy to go overboard!). Since linen comes in all kinds of natural colors (ivory, tan, grey) as well as brights (bleached white, blues, reds, and greens), you’re sure to find at least one linen item you can incorporate to your existing wardrobe.